Great casino, restaurants and pool area. Our room was very dated and nothing special. Very few outlets in the Room to charge electronic devices. Fremont street is in poor shape. Room was ok, but that l’s it. I guess I was expecting much more for a room that was over $200 (fees, fees, fees) a night. We arrived to our room there were wrappers behind door in bathroom. Then in the camode were cigarette tabaco shavings in the camode. I just felt the room had a fast run over. I was glad we had one night. The housekeeping staff was extremely inconsistent in the level of service that was provided. Some days it seemed that the only thing they did was make the bed. We had to ask for towels on several occasions because they would take the dirty ones and not replace with clean. The floors were never cleaned. The internet service, which is part the added resort fee, only worked about a quarter of the time. Clean, polite, informative. I always needed help with directions, everyone was friendly and directed me. The food was good in the restaurants. The buffet was excellent. 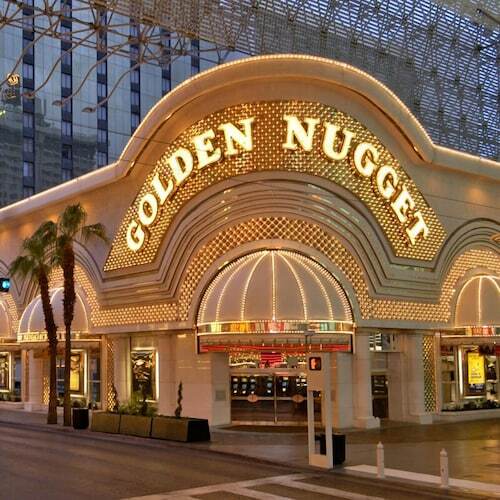 Located in Downtown Las Vegas within a short walk of Fremont Street Experience, Golden Nugget Las Vegas Hotel & Casino is within a mile (2 km) of other popular sights such as Las Vegas North Premium Outlets. This 2419-room, 4-star resort welcomes business and leisure travelers with 2 outdoor pools, a full-service spa, and a casino. This resort is home to 9 onsite restaurants, perfect for a quick bite to eat. Savor a meal from the comfort of your room with 24-hour room service, or get a quick energy boost at the 2 coffee shops/cafés. Start your day off with breakfast, available for a fee. An LED TV comes with cable channels and pay movies, and guests can stay connected with WiFi. Beds sport premium bedding and the bathroom offers a hair dryer and free toiletries. Other standard amenities include free newspapers, a laptop-compatible safe, and a phone. Golden Nugget Las Vegas Hotel & Casino features a full-service spa, 2 outdoor pools, and a casino. Free valet and self parking are available, and there's also limo/town car service. The 24-hour front desk has multilingual staff ready to assist with dry cleaning/laundry and securing valuables. Other amenities at this spa resort include a nightclub, a fitness center, and a spa tub. It is with heavy regret to learn that we fell short of your expectations during your recent stay. We hope that you allow us another opportunity to serve you in one of our other room types. The resort has 2 outdoor swimming pools and a spa tub. A waterslide, a sauna, and a fitness center are other recreation options.